This year was the first time Reese went on an Easter egg hunt. It was outdoors and there was snow on the ground. She liked picking up the eggs but didn't realize at the time that there were goodies inside. Had she known, I'm sure she would have put the eggs in her own basket instead of helping other kids put eggs in theirs. She was terrified of the Easter bunny, who happened to be one of Will's friends in disguise. If he even started walking in our direction she would cuddle up to me and try to hide. The weather was so cold that we opened our eggs in the car. Here's Reese showing off a chocolate egg- her favorite. She became pretty good at unwrapping the foil and wanted more while her mouth was still full. Anna said I would post pictures of my trip to Spain and Israel so here we go. There were 12 students and 5 faculty that went on the trip. 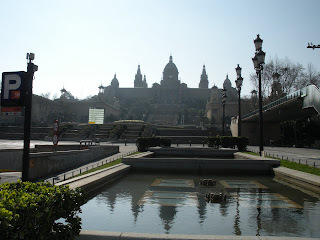 Our first stop was Barcelona or for those of you that have been to Spain Barthselona. They speak funny Spanish there. We got there Saturday jet lagged and tired but excited. I actually look okay here but this was after 14 hours of flight. Matt and Jordan give a preview of what we had for dinner the first night, yummy paella and seafood. The next morning we had a free day to go see some of the sights of Barcelona. We went to an old city replica. It was pretty cool and then later we went to Sagrada Familia, a Cathedral under construction for the past 120 years or so and expected to be finished in 2030. Monday was filled with business visits to ACS (they do HR work for other companies), Huntsman Performance Products, and ESADE (Spanish University and we met with Simon Dolan one of our professors mentors). This is a castle down the street from our hotel. This is some of us in the in a replica of the old Barcelona city. A bigger group us of after going through Sagrada Familia. Tuesday was an early start, 3:30am, so we could get to the Airport and fly to Paris and then Tel Aviv. The flights weren't too bad this time but when we did enter Israeli airspace we had were to sit in our seats and buckle our seat belts. It kind of seemed extreme but it sure made it real that we were going to Israel. Going through customs in Israel was an interesting experience. We all did the American things and went to the shortest line, apparently it is probably a better idea to go through as a group. But the customs agent that helped me thought my name was Joseph, my middle name and he pronounced it Yoseph. He asked me a ton of questions about my family. I realized afterward that it he might have been trying to figure out if I was a Jew, some of group members thought that I could pass for a Polish Jew and some people took me for a Hebrew or Arabic speaker a couple of times. 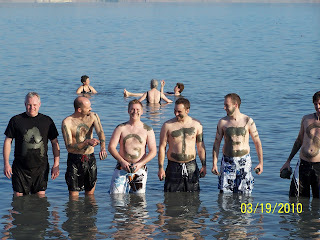 In Israel we started out in Haifa, spent a couple of days there, then travel to the Sea of Galilee, and lastly Jerusalem. The whole group in Haifa overlooking the Mediterranean. Lunch at the Sea of Galilee was St. Peter's Fish (sounds cooler than tilapia) and we paid way too much for it, but they make good pita bread and sauces to dip the bread in. The wall below the Dome of the Rock is the Western Wall. This is a couple of hours before the start of the Sabbath. View from the Jerusalem Center. Dip in the Dead Sea. 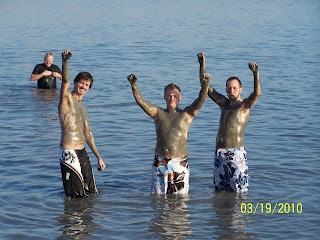 The muds is supposed to be good for the skin, doesn't take your chest hair off (I tried). It was also game day for the USU Aggies in the NCAA tournament. Some of the other highlights were going to the Garden Tomb, visiting Capernaum, shopping in the street markets in Jerusalem, Bethlehem, and visiting a defense contractor near Haifa. There are some other fun pictures. Let me know if you want to see them. Reese's crib converts into a toddler bed and this past week we made the change. We wanted her to be used to the bed before the new baby came so that when we needed the crib to be a crib again she would be okay. In case you were wondering what's on her head, it's the pair of bloomers that came with her Easter dress. She's also sporting last fall's fleece jacket that is now too small. Gotta love little laundry helpers. Gee, I'm so glad that Spring is finally here. Blah.